Most people probably think of Barratt as a company that builds ‘boxes’. But we’re actually building a wide range of fantastic homes and buildings across the UK; from new starter homes, detached family homes, luxury penthouse apartments to retail units and leisure centres. Our developments are innovative in their design and we’re working hard on the sustainability agenda. And of course we don’t just have careers in construction, we develop careers in quantity surveying, engineering, HR, finance, and in sales as well. So there are lots and very far-reaching management and development opportunities. Although we’re in the FTSE 100, we’re perhaps not an organisation that would ordinarily be considered to develop a graduate career. But we’ve won lots of awards for our graduate programmes – including best training programme for women in construction. We’re ranked first in The Job Crowd’s Best Companies for Graduates to Work For list in our sector, and second overall to Microsoft. We’re not looking for people who just want a job, we want people who are work-ready and have high potential in terms of their management and leadership skills as well as their core discipline. Nottingham Trent University continues to have a great reputation and also delivers a wide range of courses in the built environment and business school as well, which capture all the backgrounds that we’re looking for. NTU also works really hard and is really proactive. 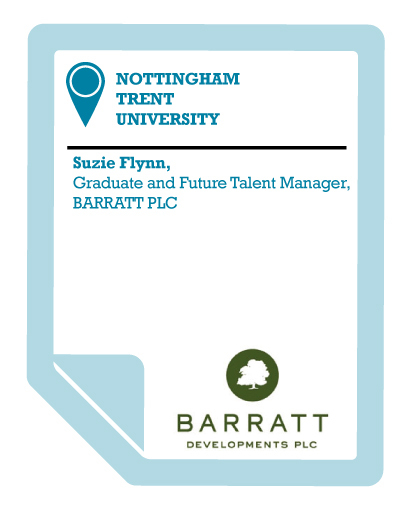 For example, the University frequently invites us in for mutually beneficial events, where we contribute as a guest speaker or take part in a networking session but also get to see and engage with students who perhaps ordinarily wouldn’t have considered Barratt as an employer. That’s excellent. That’s what I really like about Nottingham Trent. NTU is working hard on the employability front. Every single graduate that we’ve had from NTU has been superb. I couldn’t ask for anything more to be honest. I think I’ve just become quite reliant on NTU because I know that if I get an application from an NTU student or graduate and they come through the telephone interview process and assessment centre, I just know they are going to be a little bit ahead of the game compared to some of the other universities. And every single one of them, without a doubt, has hit the ground running when they’ve joined the programme. Working with NTU gives us really work-ready employable graduates with the potential to do really well. That helps our business no end. We’re also working with NTU on a business project, a research project. This gives us better links to businesses, universities and other stakeholders together to solve real world problems. I would absolutely recommend working with NTU. You’ve got to be prepared to invest some of your time and effort to do it, which can be difficult (and I know how busy I am and how busy my colleagues are in different organisations). But it absolutely pays off to create those relationships with the university because it means you’ll be rewarded with some great candidates coming through who have some great work-ready skills and who are very employable.